The Cardiofax G electrocardiogram was designed to address efficient examination, one of the main needs amongst cardiologists and caregivers. Nihon Kohden stands for improving patient safety, reliability, and efficiency: With its large 15’’ color touch display, data can be viewed easily, even in the same size as on the recording paper, and allows for an ECG preview before recording. A flexible arm guarantees a clear view of the color display from various angles and efficiency tools like customizable smart keys or a help function for ECG electrodes placement improves and simplifies the caregivers’ workflow. Nihon Kohden’s breakthrough technology supports clinicians in testing more patients with enhanced information available for analysis: The synECi18 technology provides 18-lead ECG information from a 12-lead ECG, thus optimizing patient safety and functioning as a great triage tool. High visibility: The large 15” color touch display shows ECG in the actual size of the printout. A maximum of 5 minutes of 1-channel ECG waveform can be shown on the display for arrhythmia analysis. Moreover, patient information can easily be seen on the screen. The flexible mounting arm provides the best possible angle in accordance with the customer’s preferences thus guaranteeing the best possible visibility. Easy operation: The touch panel display shows all of the keys right on the screen for intuitive operation. The on-screen guide function supports the caregivers in electrode placement. The last examination can be reviewed to compare the waveform on the examination display with just one touch. Efficient workflow: A start/stop key on the patient input box improves caregiver’s workflow. Customizable keys, which can be used for common functions in daily operation, support efficiency. Up to a maximum of 10 minutes waveform can be stored internally to avoid any loss of data. 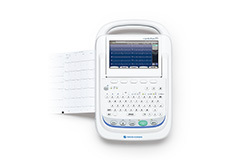 Smart design: The table type recorder allows for fast confirmation of waveform and, if necessary, the physician can directly write comments on the recording paper without having to cut the paper, while using the ECG table recorder as a pad. Electronic recording: The preview function allows for checking of waveforms and analysis results before recording. On paperless mode, waveform and analysis results can be transferred to a PC for review. Easy data transfer: Up to 800 ECG files can be stored in the internal memory. Approximately 48,000 ECG files can be stored in a SD memory card. Capability to transfer the ECG data to a PC using LAN. High level 12-lead ECG analysis: Cardiofax G includes Nihon Kohden’s latest interpretation program, the ECAPS 12C analysis program. It provides simultaneous 12-lead ECG acquisition for up to 24 seconds and analysis with approximately 200 findings and 5 judgment categories. 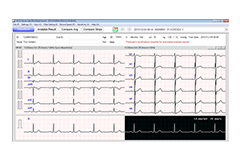 ECAPS 12C can also find typical waveforms of Brugada-type electrocardiograms. synECi18: Nihon Kohden developed synECi18, a breakthrough technology, to provide 18-lead ECG information from a standard 12-lead ECG via synthesis of the additional leads V3R to V5R and V7 to V9 to help identify invisible ischemia. Especially when presentation is not typical or initial 12-lead ECG is negative, diagnostic inaccuracy may cause harmful delays. Timely ischemia detection may prevent myocardial damage or may shorten the time to PCI (percutaneous coronary intervention) indication. With the same workload and costs as associated with the standard ECG procedure, patient safety is optimized and this may reduce time to reperfusion. Especially in emergencies, synECi18 is regarded as a useful triage tool to enhance outcomes through early recognition and stratification. High performance IEC 60601-2-25:2011: Cardiofax G complies with IEC standard IEC 60601-2-25:2011, which approves high accuracy of signal processing (AC filtering), ECG measurement, and ECG analysis. It aids in accurate ECG diagnosis.